Did you know that there’s an effective natural remedy that’s completely free, a remedy that you’re probably only steps away from right now? It’s called grounding, or earthing. And it can change your world! Read on to find out more. 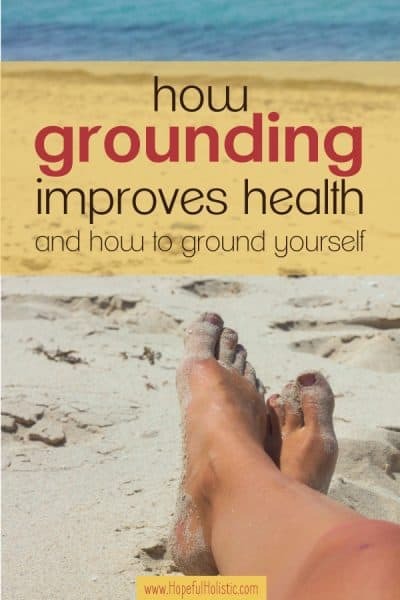 Grounding, also known as earthing, is simply touching skin to earth to experience grounding benefits. This might sound simple, automatic even, but it’s a rare experience today. For thousands of years, humans have been in direct contact with the earth. As technology advances, we become less and less in touch in many ways- we aren’t connected to where our food comes from or is grown, we don’t get as much sunlight, we aren’t in nature, and we aren’t earthing. With our rubber-soled shoes and skyscrapers, we can go days without touching the ground. But research is showing more and more reasons that this can be detrimental to our health. As we go through our busy, technology-filled lives, we are constantly exposed to EMFs -electromagnetic frequencies. EMFs come at us from Wi-Fi, cell phones, and pretty much anything that plugs into the wall. EMFs cause a build-up of positive ions in our bodies, and we naturally accumulate them as well. They’re in our atmosphere and environment. If we aren’t releasing positive ions regularly enough, through grounding or other means, they’ll start to build up. Too many positive ions are damaging to our bodies. An overabundance of positive ions can sap energy, increase depression, cause headaches, lead to aches and pains, and increase the risk of other health problems and the time it takes to recover. Have you ever noticed that before a storm you might feel more achy or irritable? That’s because, before a storm, positive ions jump to more than three times the amount of negative ions. The elderly are especially susceptible to a buildup of positive ions, and they are more likely to become lethargic and depressed. Thankfully, no matter your age, there is a way to alleviate all these symptoms, and it’s completely free! The surface of the earth has a negative ionic charge. Grounding helps to release those extra positive ions you’re carrying and restore balance. Grounding benefits include restoring balance to all of the negative effects of positive ions listed above. Daily grounding can help you sleep better, feel better, and heal faster! Just as there are greater tension and discomfort before a storm, nice weather can actually help relieve symptoms from chronic illness, asthma, depression, and more. There’s even negative ion therapy for mood disorders such as depression. We can’t control the weather, but we can control how much we ground ourselves. Simply discharging positive electrons through direct contact with the earth can help with mood, arthritis symptoms, inflammation, anxiety, high blood pressure, joint pain, and more! I’ve even heard of mothers with babies who had terrible colic, and the only thing that would help them to stop crying was when their mother was grounding and had skin-to-skin contact with the baby. Increasing negative ions can also shift the body’s balance towards more alkaline, which is a healthier state for us to be in. Negative ions also help with metabolizing vitamins, and it balances the function of serotonin and the endocrine glands, which leads to more balanced hormones and a balanced menstrual system. We should all ground ourselves every day to experience the grounding benefits that our bodies need as we accumulate positive ions. The simplest way to ground is just to go outside in bare feet, and touch the earth for about 20 minutes. You don’t need to just stand there though! Go for walk for some peace and stress relief, or forage for dandelions! Because why not? 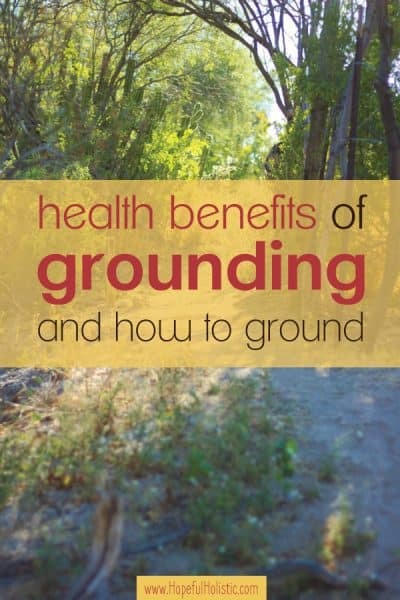 It also counts as grounding if you’re standing on unsealed concrete or wood that’s touching the earth, and you can still get grounding benefits while wearing socks. To maximize the health benefits of grounding, it’s best to go somewhere where the air has high amounts of negative ions as well. This includes places out in nature– forests, waterfalls, mountains, and beaches. If you’ve ever noticed how you sleep better when you’re near the ocean or after walking along the beach, that’s why! Unfortunately, even the wilderness doesn’t have the clean air it used to, thanks to chemtrails and pollutants in the atmosphere, but it’s better than the middle of the city! Just getting out into nature helps with stress relief and creates a sense of peace, even if you aren’t grounding. While you’re outside, go ahead and hug a tree too! Just being close to a tree can actually change your electrical frequency. This is a great option if you don’t have a lot of time for a walk, and it’s fantastic for people who are on their computer or phone a lot during the day. But what about during winter, when you might not want to be tromping around barefoot? And what do you do if you work inside all day like me? Thankfully, even though technology increases the EMFs bombarding us, technology also gives us the means to reduce damage from EMFs. I use a grounding mat under my desk every day, and I sit with either socks or bare feet touching it while I’m working on the computer. I’m currently using a mat by Landkissing, and I love it! It lets me release positive ions all day while sitting inside. It works by plugging into the grounding part of the outlet (that’s the round hole- you might need a different brand if your outlets look different than the ones in the US). Hubs took the other mat and put it under his keyboard at work so his hands can touch it. Along with my grounding mat, hubs had the great idea of getting a cheap outlet tester to make sure all our outlets work for grounding. We found a couple outlets that weren’t actually grounded, where my mat would do no good at all! If you want a good (and inexpensive!) outlet tester, this is the one we use. I think that grounding yourself in the winter can be even more important than other times of the year, and having a grounding mat makes all the difference. Experiencing grounding benefits in the winter can help with the lethargy and depression that increases during the coldest months of the year, times when we aren’t getting as much sunlight and aren’t going outside barefoot. One of my favorite ways to fight SAD (Seasonal Affective Disorder) is with my grounding mat. But I also couldn’t live without my wakeup light- this one creates a natural sunrise to wake up to so that you aren’t waking up to darkness throughout the winter! It works like a happy light too- you can also leave it on throughout the day to help boost your mood and energy when there isn’t a ton of natural light available. Just be aware that if you haven’t been grounding much, you might experience a detox reaction while your body frees itself of positive ions. If you’re earthing and feel worse, it might be because you’re doing too much too fast. A grounding detox reaction might look like insomnia or a feverish feeling. If this happens, you’re detoxing too quick and will need to reduce your grounding time. If you’re just starting out with grounding, only do it for 15-20 minutes a day while your body gets used to it. You can increase by about 30 minutes a day until you’re doing it 24/7! You can even sleep while grounded for better sleep! There are grounding sheets like these available, which plug into the wall and are made from cotton with a silver interwoven grid that contacts your lower legs while you’re sleeping. Grounding sheets help you sleep better and wake up feeling rested. They also reduce stress and nightly aches and pains. Try out a grounding sheet yourself and see how much energy it gives you! You can also sleep using the grounding mat I mentioned above- it comes with an ankle strap for overnight use! There are also grounding shoes like these. Leather grounding moccasins protect your feet without blocking you from receiving grounding benefits. You can wear socks for warmth and still ground yourself with these shoes. Plus they look pretty dang cool! Here’s a men’s pair of grounding moccasins. Unfortunately, I couldn’t find a vegan version, but I’m keeping an eye out for one! Of course, it would be better for your overall health if you didn’t build up too many positive ions to begin with. Prevention works wonders. But how do we reduce our exposure to invisible ions? One way to reduce positive ion build-up is with a salt rock lamp. I’ll admit that there isn’t a ton of scientific evidence showing how much salt rock lamps reduce positive ions, but there certainly aren’t any negative side effects! I say that if it makes you feel good, use it. Plants can also help purify the air and produce negative ions from their leaves. They reduce pollutants, toxins, and allergens in the air. Some of the best houseplants for air purification include snake plants, English ivy (this one is a great price! ), peace lilies, spider plants, and aloe vera. For air purification and reduced positive ions, you should have at least one houseplant for every hundred square feet. Want more tips on getting rid of toxins? Grounding is a fantastic step in the right direction, but there are loads of other things you can do to help your body get rid of the things that are harming it! Reducing your exposure to toxins is one way to give your body the best chance it can have at healing and preventing disease. Make sure you check out my guide to reducing toxins- you can get it here! Beyond grounding, there are a lot of things you can do to support yourself at an energetic level. One of the ways I do this is by learning about and using my strategy according to human design- this is a revolutionary personality tool that’s all about your unique energy blueprint. It helps you discover how you absorb and use energy, produce energy, and how you can sleep better, make good decisions, and better align with your authentic self. Living by your unique human design strategy can change your life. To learn more about human design, check out this post: human design- what is it and how can it change your life? You can also get your FREE human design chart to start learning more about yourself and your energy.